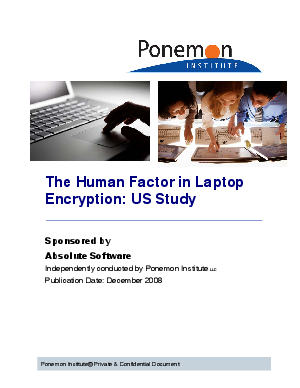 In this whitepaper, the Ponemon Institute shares its findings on the use of encryption on laptops by corporate employees. It shows that many employees may not be taking the most basic precautions to secure their company laptop. Key findings include: Only 52 percent of business managers have employer-provided encryption installed; 56 percent of business managers have disengaged their laptop's encryption; and, 61% of business managers share their passwords, compared to only 4 percent of IT managers.